Go ahead, write a caption for this one in the comments. I’m speechless. Kind of reminds me of the movie Logan’s Run. Ten bucks says each of those guys has more than one leisure suit in their closets. My mother made matching caftans for herself and my dad. I believe it was for a “hippie” party at church. And I’m sure it hung right next to his GREEN leisure suit! A couple of years ago, our fiber arts group was offered a box of old knitting and crochet patterns from an elderly woman who was cleaning out her closet. It was a veritable time capsule of mid-20th century fashion, both the good and the excruciatingly bad. Imagine, if you can, the above caftan executed in crochet. In orange. Or a knit bikini. One member of our group actually received a crochet bathing suit as a teen-ager, lovingly made by her grandmother. I’m just so grateful that neither of my grandmas, both exceptional needle women, ever found that pattern. The young Radagast the Brown. 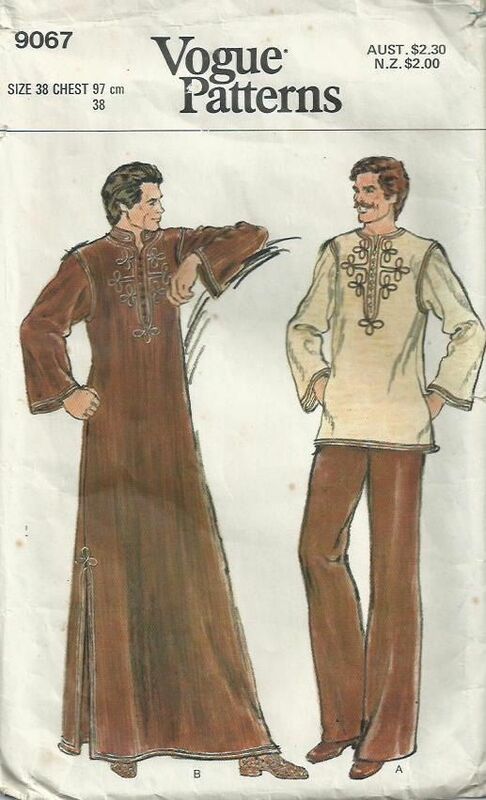 OK, my husband wore caftans at home in the early 70s but he’s 70 now so he was in fashion back then. BTW I wore caftans at home in the 70s too – especially 74 & 77 when I was pregnant in the summer, kept me cool and comfortable. ‘Right behind, a pair of men were having a heated argument. One of them was a very old wizard who was wearing a long flowery nightgown. The other was clearly a Ministry wizard; he was holding out a pair of pinstriped trousers and almost crying with exasperation. “Muggle *women* wear them, Archie, not the men. They wear *these*,” said the Ministry wizard, and he brandished the pinstriped trousers. I actually have that pattern in my collection, and have made the shorter tunic one for my husband. He loves them, and regularly wears a caftan around the house in the summer for comfort. He’s got two of the long ones right now, one of which I made him (though not using that pattern – he doesn’t quite fit it anymore) and one which he found in an import place somewhere. He’s asked me to make him another one. I bought some bright orange paisley for him, and he thinks it’s the funniest thing ever, and can’t wait for me to finish it. I think I’ll make a darker, solid colour collar for it, and embroider it for him. He can be as hippy as he likes! It doesn’t bother me in the slightest! There are patterns for all kinds of things including clerical cassocks and vestments, traditional and ethnic wear and all manner of costumes and historic pieces. Clearly, what you’ve got there is from a time when patterns didn’t cost half the price of what you hope to make and another part of the world, but it’s worth considering that an essential aspect of patterns is that they include what can’t be commonly found. Mock if you like but most of the population would have a similar reaction to the idea of making shoes or a domestic uniform based on a 60s era Soviet model. I was very entertained by most of the humorous comments here, but I have to say, you are absolutely right. A sample of the time, without reference to the other facts of the time, can make a whole culture or enterprise seem patently ridiculous. Best to look at this in context. Oh dear! Very disillusioning to anyone whose concept of Australian manhood in the 1970’s was based on Mad Max. Clearly a mismatch here. Definitely from a more innocent age! I think I might have this one in the attic collection of old patterns! My stepdad wore caftans frequently – cool and comfy. It’s a staple in the Arab countries for comfort and airflow. I love them myself. Joseph has a black version of the short one he got in Egypt and looks great in. Don’t dis the caftan! Bring back the caftan! From the Timothy Leary Collection. LOL! In the early ’70’s I made myself a yellow crochet bikini from a kit. My husband LOVED it! And I still love caftans and think this is a really nice pattern. I’m sure those Arab men know how to stay cool in the desert heat so don’t knock it till you try it! Do you have any photos of the crochet bikini? my favorite comment surely the winner!!! !………….Biff BWAHAHA!!!! !